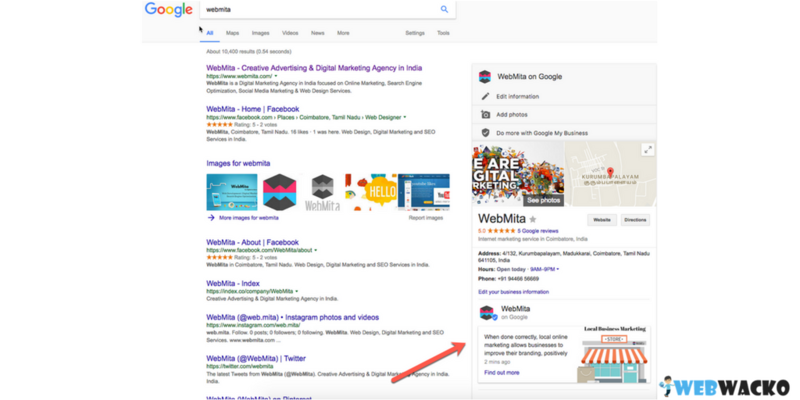 Example – What is the Need of Google Post for My Local Business? How to use Google My Business for Your Local Business? Google has announced a brand new feature called Google post recently. Google post was first accessible only in the US for politicians at the time of elections. 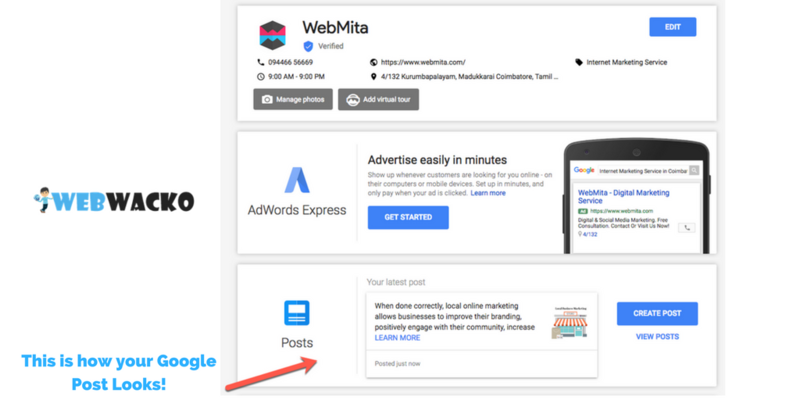 Later this June, Google introduced Google post in the US and then Brazil, currently users can access the post feature from Google My Business (GMB) platform. Business owners can add, modify & delete a post via desktop & Google My Business app (available for all major platforms). 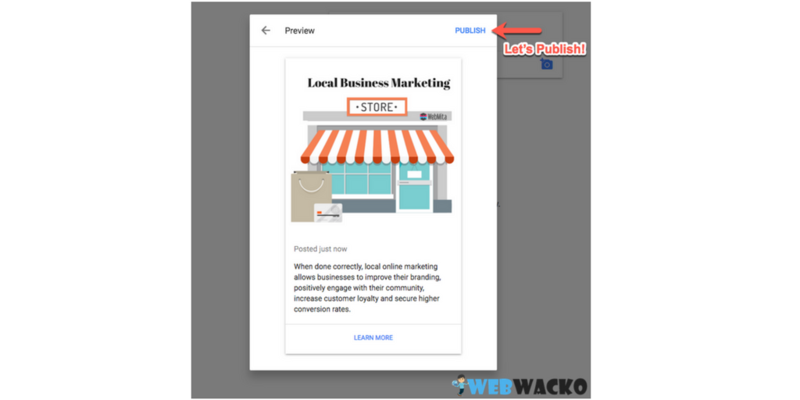 In this article, we are going to see how can publish a post on your “My Business Page,” by using the new feature “Google Post”. The Google Post can help business owners to publicize their daily specials, offers, promotions and events as a post in Google My Business page. 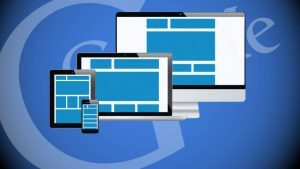 Google made some serious changes on Post later last week, a post will be published with a seven days expiry date, and remove in seven days after publishing. The Google Post which will publish as forthcoming events will get removed after the future event date. Google will send an alert in Local business shortly before the expiry date. For a better explanation, I’m going to take an example of a local restaurant business. Consider you own a chain of restaurants in a major city and you are having a Google My Business pages for all of its outlets. You Restaurant Business group is conducting a food festival for a month, so you are publishing a menu for 30 days as a Google post update in your “My Business page”. After seven days your post will get expired or removed from Google My business pages standard view. The only possible solution is to create a menu for seven days or update the post daily in Google My Business. In Simple, Google local business is a platform for local business/store owners to mark their location in Google Map. While a lot of people are searching in Google maps to find business locations, government buildings, hospitals, schools and much more. 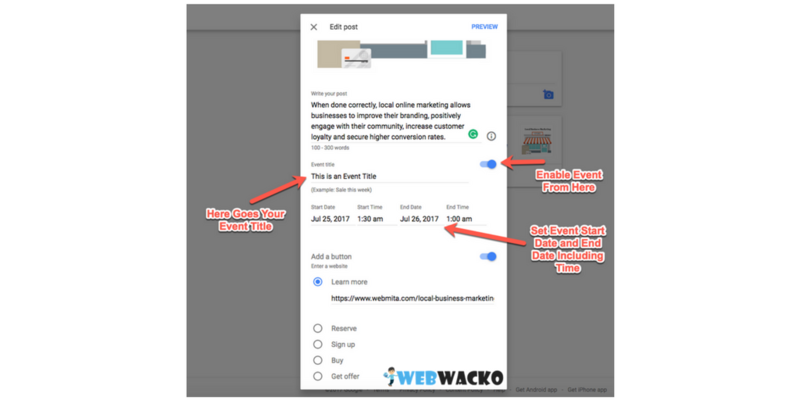 This step is a huge gateway for retail store owners to pitch for their business in Google based on the type of service they are offering. Upload/update photos in business pages, Add pictures of the store front, events, daily specials, customer engagement programs and more. Your Images will reach a mass audience who are searching for the related business on particular locations. 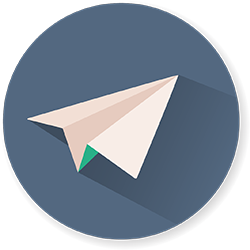 Track the performance: Analytics data of every click, search, call, driving direction recorded in the backend. You can easily access this by logging into Google My Business page and find how your business is booming through Google My Business. Know how customers locate your business, the customer can get a business location in two ways. Discovery Search: When a user searches by using common keywords related to your business based on a location. The best thing is to be present in the first three positions of local search results. Direct Search: People are searching for your exact business name based on a location. 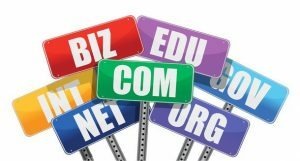 If your brand is widely known for a business service and also popular in a region or city so that people will search your company name in Google search. The average CTR for a direct search is higher than a discovery search. Customer Reviews & Rating: Customer engagement is the key element for a successful business, Customer ratings are so crucial in local business, the user can rate your local business with a maximum of 5 stars and a minimum of 1 star based on his experience. You can evaluate a business easily by reading some of the reviews. You don’t need to pay money to Google for using the “Google Post” feature. It is completely free, and it is a great benefit to your business. Login to your Google My Business account here if only you have any published Google local business pages. 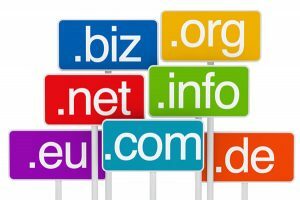 Login to Google My Business account from here, or you can directly access to Google Posts from here. Once you logged in to your account, select a published Google My Business Page. 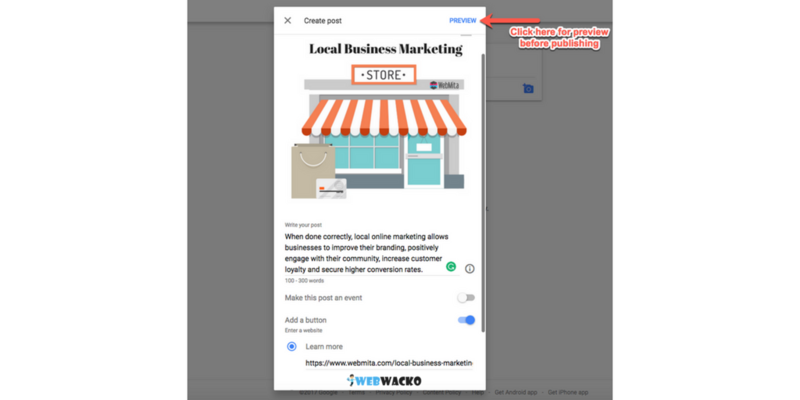 In the dashboard, Select a published Google My Business location, Now you can see a newly updated post feature on the left-hand side of menu placed under Home. 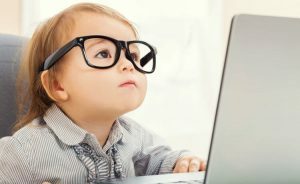 You can start using the post feature by clicking on ‘post.’ After publishing a post, you can access this edited post under the same category. A box will appear in the middle of the screen with “write a post” in the text field. 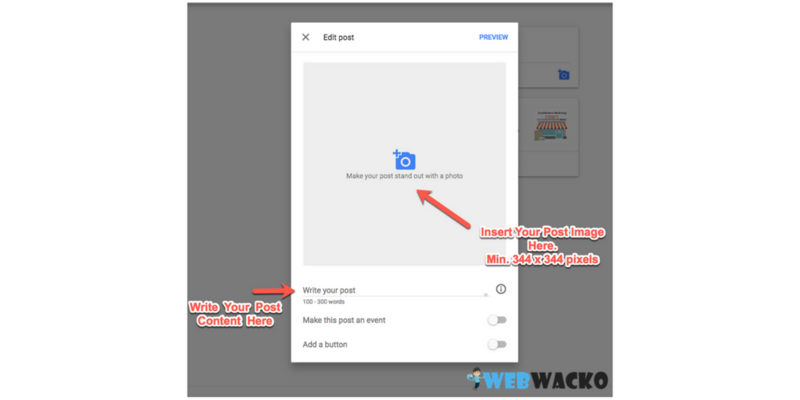 Click inside the area for crafting your new Google post. Add relevant image (Minimum 344 x 344 pixels). Content within 100 to 300 words range. You have an option to add an event in your Google post. You can update the customers about a special event which will conduct in between a specified date range. 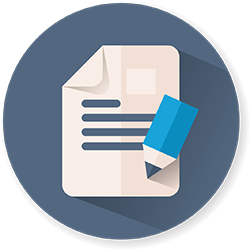 This process will lead the potential customers to your facility for doing business. The event will act as an open invitation to the public who are seeking your business service. Our final step! 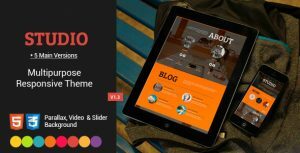 Publish your post. 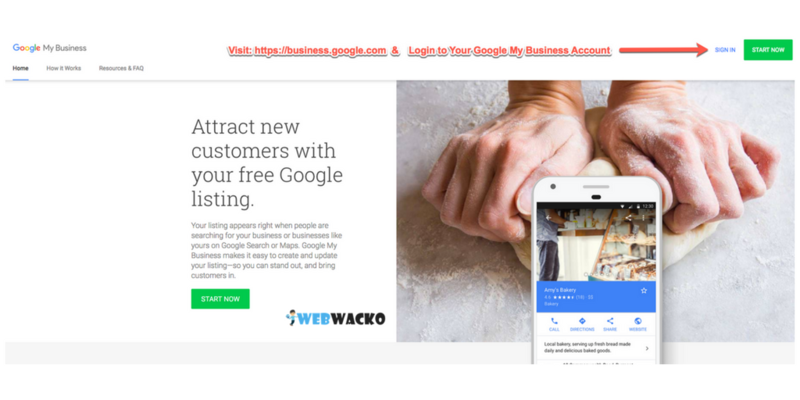 Now your first Google Business Post has been successfully published! Once you published your post, you can able to check the post insights from the dashboard. Note: Your posts will be available within minutes on your Business Search Page. Have a look the below example. 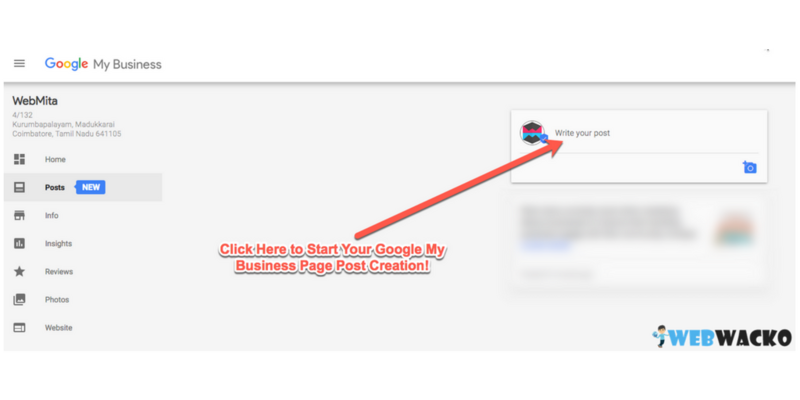 I hope, now you know how to create a post in Google My Business platform for your local business. If you need any help, feel free to post a comment below or ask your questions on WebWacko Forums. I just noticed that Google My Business has this post publishing option. 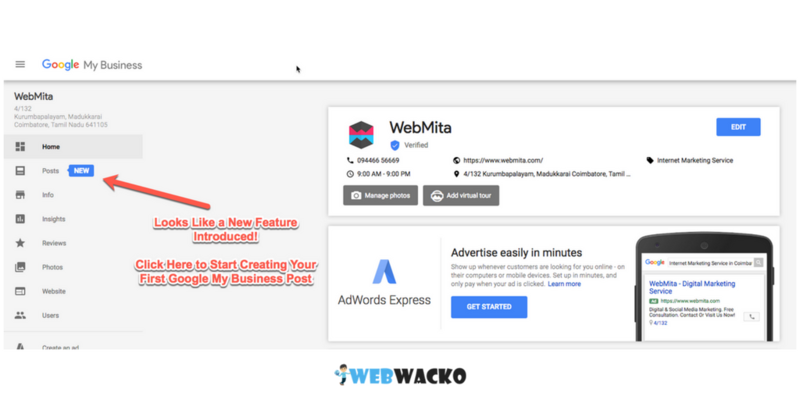 Welcome to WebWacko and thank you for reading our article on How to Create a Post in Google My Business? A Step By Step Guide!